A Daily Dose of Fit: Gatorade...or something like it. You all know how much I like trying healthy alternatives to chemical-laden sports drinks, and you also know I like jazzing up my water. We talked about Crystal Light PureFitness, Metromint, and even coconut water. And now I'd like to discuss Gatorade. Wait...what? Yes, Gatorade. But not the brightly bottled version you find at the grocery or convenience store. I'm talking about the kind you can make at home. Intrigued? I was. There are about 67 cooking blogs bookmarked in my Firefox browser, and I check them all on a regular basis. Recently, Emily at The Front Burner referenced her homemade Gatorade recipe. Copy, paste and print for the recipe binder! And she so graciously allowed me to share it with you. Just mix and enjoy! 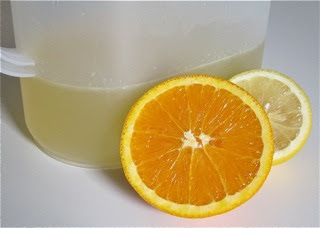 The orange and lemon juices create flavor while providing additional water (among other nutrients like Vitamin C). The sugar acts as both a sweetener and a carbohydrate. If it freaks you out, remember that sugar is better than high fructose corn syrup any day of the week. And the salt? Sodium is a natural electrolyte that helps keep your body hydrated. I feel as though you could eliminate it if you wanted to. In all actuality, this recipe is one that leaves room for interpretation. I'm interested in trying it with some lime juice—half a tablespoon each of lime and lemon juice instead of just one full tablespoon of lemon juice, perhaps. How would you tweak it?